We decided to move to the south of Montenegro and start our tour this year in the town of Ulcinj. Here we spent three nights on the beach just outside the town of about 8,000 people (25,000 in the whole district) and which had a very comfortable feel to it with modern coffee shops and very good restaurants. We found a wonderful camping place called “Autokamp Miami” which had only been open 2weeks. The facilities were excellent and it was a 2minute walk to the beach. The hairdresser whom I visited suggested we eat at “Manhattan” which offered excellent Italian food and fresh fish. I don’t know why they want to call a lot of their locations American names. I think it would be much nicer to use Montenegran names. said that he liked living in a small town which was extremely safe (no keys needed in houses or cars!) with no drugs or criminality,no pollution,good climate and good fresh food. He had a point! He was a mine of information and gave us names of places to visit and food to eat. He wanted to tell me what they ate in the mountains but couldn’t find the English word so said “Baaaa”. I got the message. Our first day which was warm but raining was spent shopping in the lovely small shops in town. I bought a handbag and two tops and Maurice bought a nice black leather windcheater jacket. The prices are very reasonable and a lot of the goods were made in Italy. Most people who passed us said hello and several came up to us to see if we had found a camping place. The waiters in two restaurants were just so obliging and the service was second to none and all was done with a genuine smile. Our second day was warm and sunny so we went to “Ada Bojana” a small town on a large inlet about 1/2 hour from Ulcinj and very close to the border of Albania. We ate nice fresh fish and fish soup and stopped further down the road for coffee. Montenegro is much poorer and prices lower than in Croatia but one can see they are catching up with a lot of construction of large houses and appartment blocks for lease and for sale, many with signs in Russian. The chap at the camping reception told us that there is quite a gulf between the rich and the poor in Montenegro. Apparently there were many 5 star hotels before the war but as a result of the war further north and east that tourism dropped so much so that most of the hotels closed. We were told that a lot of the Ulcinj residents have large houses with many rooms and in the high season some can make up to 700 euros a day. After 3nights in Ulcinj and waking to a rainy miserable day, we decided to head north to see the old town of Budva. It caters more to tourists with trendy cafes and a very upmarket shopping centre but still the old town surrounded by high walls was interesting to see. The weather improved with lots of sunshine and it was not cold. We had some lunch in the van and then climbed with the van from Budva through the mountains to the old Royal Capital of Cetinje. Before we reached Cetinje we saw dozens of “slep autos” – cars for hire and sale all along the road in the middle of nowhere. We saw many old mercedes cars and other older cars in Montenegro. The wealthier types seem to favour BMW’s and most don’t worry about parking anywhere legally. The mountains were very rocky and there was a lot of low lying cloud and mist which cleared the closer we got to the coast. of managing the 25 hairpin bends. We arrived in Kotor (a beautiful town on the bay) and were told that there were no camping sites for 25kms so we overnighted in a carpark close to the cruise ship with several other campervans next to us. It cost us 20euros for the night with no facilities but I had make a thick soup the day before so that was dinner. The castle on the hill above us was lit up at night and it looked beautiful along with all the lights around the bay. We found a nice new shopping centre called Kamelija across the road with several coffee shops,wifi and a supermarket which was handy the next morning when we wanted to check our emails. We luckily walked around inside the old city walls early in the morning as poured with rain for much of the next day. 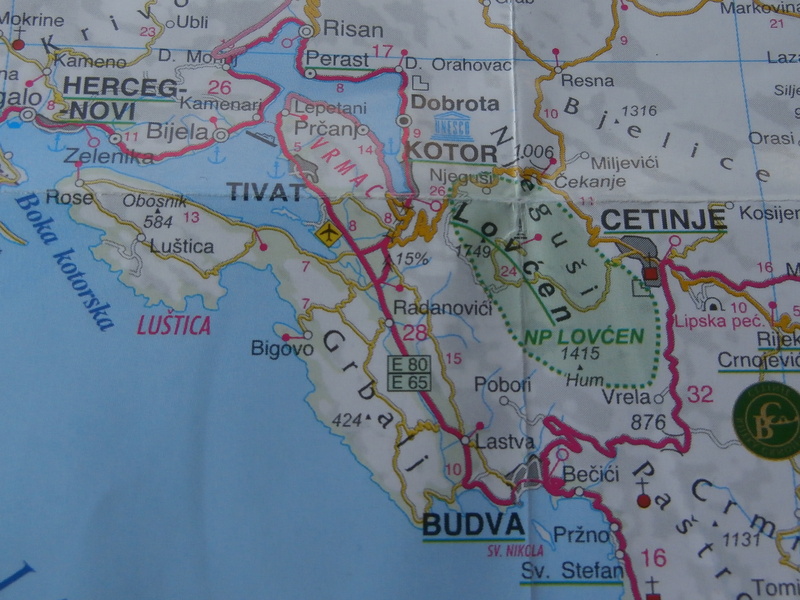 We decided to move north into Croatia which had a multitude of camping grounds compared with the few in Montenegro. Unfortunately Montenegro and Croatia have not caught up with the rest of the EU as far as their smoking laws go. People are allowed to smoke and even pipes are allowed in the coffee shops and restaurants which did nothing for my Bronchitis which is finally abating after three weeks. We saw many hitchhikers, some with signs of where they wanted to go but declined to pick anyone up. Driving along the coast and inland we saw little evidence of agriculture apart from many orange and lemon groves. We saw a few sheep, a very few cows and some goats. Very different different from Italy but then they only have 600,000 inhabitants. Unlike Italy the Montenegrans do not seem to use salt with their vegetables and with every meal is accompanied by potatoes and spinach and they do offer a variety of salads as entrees. A common language is spoken in Bosnia, Serbia, Croatia and Montenegro. Only Albania and Macedonia have different languages. When we meet anyone we try English, Italian, French but most of the locals speak some German as there used to be a great influx of Germans before the war in the neighbouring countries. Diesel here in Montenegro was 1.27euros a litre while in Italy it was 1.57euros. An espresso or cappucino only 1-1.40 euros which was similar to Italian prices. We really enjoyed the relaxed feel of Montenegro and the friendliness of it’s people as well as the spectacular scenery. It will be interesting to see if it changes in the years to come with so much more construction of appartments and houses for more and more tourists.